Foam and polyurethane internal pipeline cleaners – excellent for drying, wiping and scraping the inside of the pipeline. Can be custom made in sizes up to 72” (1829 mm) diameter. Available in Soft Density, Medium/Hard Density, Heavy Duty or Heavy Clearing . Cab be custom made with a variety of coatings (fully coated, criss cross or bare), scraping brushes (stainless steel or silicon carbide) or cavity style (pig tracker sensor). 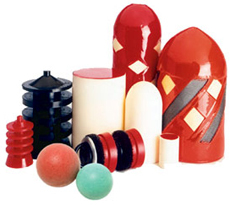 Can be ordered with urethane scraper cups, rubber discs (bi-directional), gauging and wire brushes. Manufactured from the highest quality polyurethane. Very durable and tear resistant – makes a super seal. Safe in extreme hot and cold temperatures. Used for pigging, dewatering, hydro-static testing, batching, removing paraffin wax . Comes in various lengths depending on the number of discs and/or cups required. For regular, long, heavy and heaviest scraping, wiping or drying. Maxi-Brush for maximum scraping and Maxi-Brush Light wire for long range cleaning up to 2000 miles. Foram and polyurethane balls for internal pipeline cleaning in a variety of sizes. No need for hydraulic pumps or inflation.